After you compare the two for yourself, you will know the difference. We can offer you 60 days warranty but The amazon default warranty is 30 day. 【Exquisite Craftsmanship】Made in Philadelphia, U.S.A. 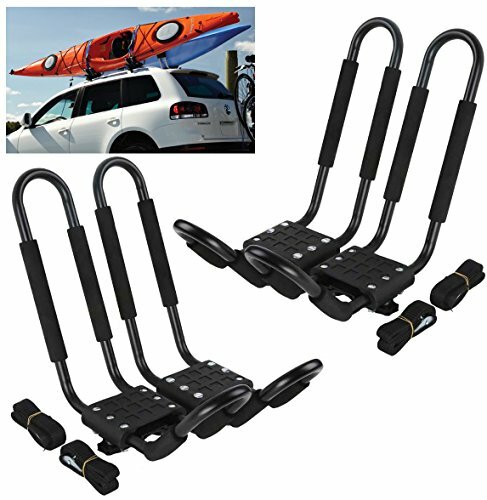 The Bars of this kayak carrier are made of 1.5mm thick steel tube, with four straps which can hold 36" Wide and up to 150 lbs Kayak. All surfaces are coated with high quality Glossy out-door paint, can resist all weather condition and use for a long life. 【Convenient to Use】Quick on/off hardware ensures fast installation and removal. Can universal fit on any style of crossbars such as Oval Shape, Square Shape, Round Shape or Blade Style. 【250 Lbs Rated Lashing Straps】Maximum Lock tight on your kayak, Canoe, 8 Ft long, 250 Lbs Tested, easy and safe for your transport. Seah Hardware Universal Roof Bar Cross-bars 2 PC. 48"